As you may know by now, I’m not a fan of Italian restaurants. But it’s only because there are so few good ones around New York–if you can believe it. Well, my friends, I’ve found a delicious Italian restaurant in Hell’s Kitchen. It’s Nizza. Cozy with swelling ambient lighting, Nizza has a small bar and about 15 tables around the restaurant. When we arrived, which was on the early side for a Friday night, we were told we had to wait 30 minutes for a table for two. MDP and I sat at the bar, sipping Maker’s Mark and a house white, respectively. The drinks weren’t exorbitantly priced, as they were last weekend at Blue Smoke, and my wine was very good. The couple sitting next to us–the male half had a staring problem–at the bar was ahead of us on the seating list, but declined their table, and opened up the opportunity for MDP and I to sit down, about 15 minutes ahead of time. We were seated at a busy intersection, near the bathroom, but we were comfortable. 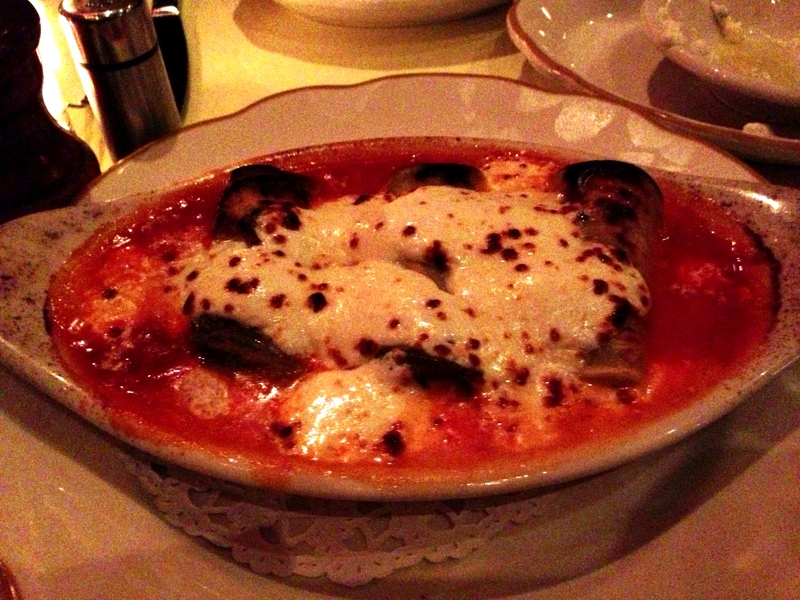 For an appetizer, we ordered the eggplant involtini, which was eggplant stuffed with ricotta and then topped with a light marinara sauce and mozzarella cheese. Rolled into little loaves, the eggplant was mild and soft, and the gooey mozzarella cheese was amply spread across the three eggplant loaves. The dish was delicious, and I’m very glad we ordered it. For his entree, MDP opted for the the picante pizza, which featured hot peppers, smoked mozzarella and spicy sausage. The crust was slightly more bloated than your typical thin-crust pizza, but it was delicious. 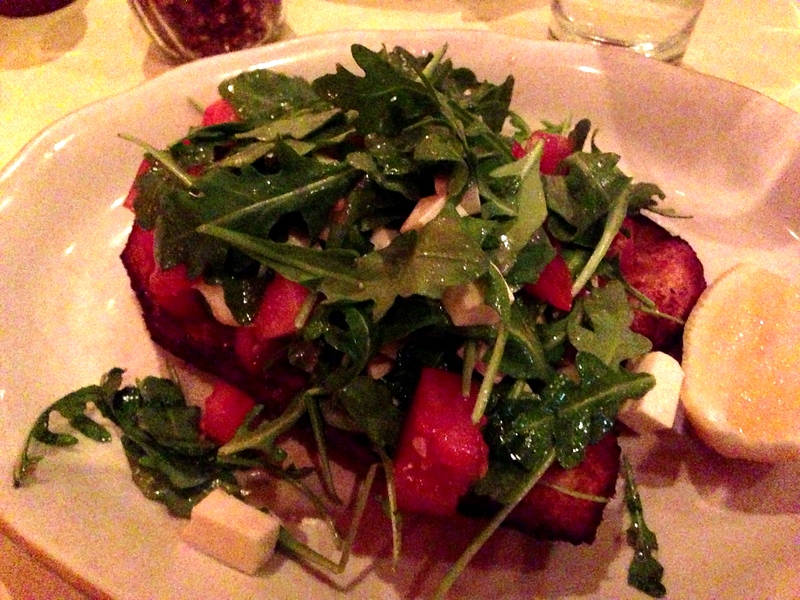 I ordered the chicken milanese, which came with a caprese salad on top of a large breast of crisp, thin chicken. I had tried this dish at Nizza on another occasion, and I liked it as much this time around as I did last time. For dessert, we got the tortoni, which is, according to the menu, Italian frozen custard with crumbled biscotti and rhubarb composta, but the composta tasted of strawberry, not rhubarb. I also tried the cappuccino, while MDP got an espresso. Like the other two courses, dessert was fantastic. I highly recommend Nizza, especially if you’re in the Hell’s Kitchen area and have some time to kill before a theatre engagement. Oh, and Nizza has a gluten-free menu, so you and your GF friends can enjoy it! Take the A/C/E to 42nd Street and walk east one avenue and north about two blocks.